whatever type of building you have, we can help you compost. all it takes is a good pickup spot. we want property managers of condominiums and apartment buildings to understand and approve of what we're doing - and ideally, to love us as much as their residents do! - We contract our members directly, so there's no payment from property management. We only ask that management help us find the best “pickup spot” for folks to leave their compostables for us on collection day - you can see some more examples on our Instagram feed - and hopefully give us their blessing! - We provide 3 gallon kitchen compost bins for all of our members, and members leave those bins out for us (in the designated area in their building) on collection day. In some buildings where we have multiple customers, we leave a small 16 gallon collection bin on site, in a spot that works for the building, and we ask members to empty their kitchen bins into this larger bin. It all depends on what management / the HOA would like to do. - We use trikes & bikes to do our work, so we don't have any access/egress requirements like a truck-based service would. And even if we do opt to leave a collection bin on site (a decision we'd only make in conjunction with management / an HOA), they're small bins. - We help properties reduce their environmental impact. Multi-family living is already a wonderful way to conserve energy & resources, and we make sure multifamily residents can decrease their waste footprint, too - and with a zero-carbon, pedal-powered service! We weigh everything we collect, and give our customers metrics on their positive impact - which is an easy addition to your management company’s corporate sustainability goals! - We typically charge residential members $15 monthly, plus a one-time $20 startup fee. We pick up once weekly for individual residents, and we can pick up twice weekly for our larger full-building contracts. pictured: Scraps compost bins at Lafayette Towers West - our very first full residential building! these five bins are emptied 2x weekly, and used by all of the building’s 39 units. property manager still worried? ease their worries. We use pedal-power - mostly trikes! - to go from pickup to pickup, emptying full compost bins along our routes. 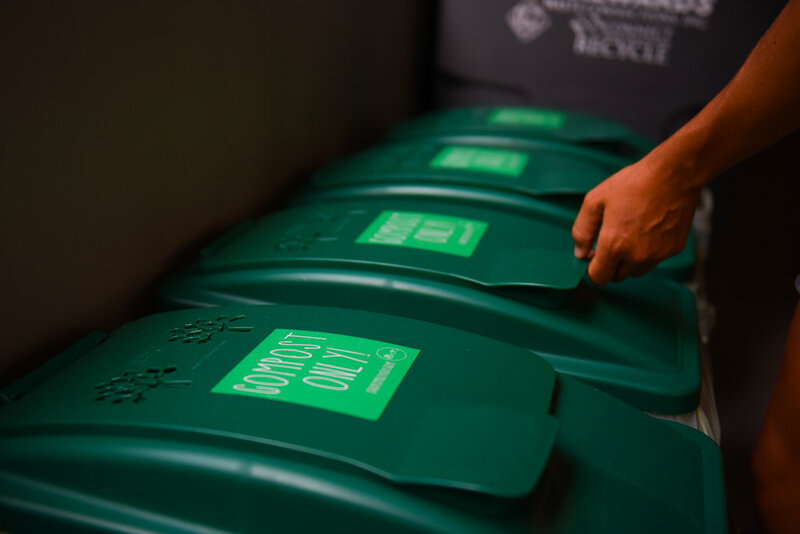 Usually our members just leave their bins out for us in their designated pickup spot, although sometimes we leave slightly larger bins on-site for them to put their compostables into, and we simply empty that one larger bin. We partner with customers of Alpine Waste & Recycling to be our "dropoff partners" - and essentially, they let us fill the extra space in their large compost "dumpsters" (often called "cans" in the biz) with the compost we collect from our customers. We don't cost anyone any money in the process. For our dropoff partners, collaborating with us means increasing the impact of their decision to compost into the wider neighborhood. For Alpine, it means great exposure, good press and often times referrals to new clients. The compostables we collect from our members are transported by Alpine Waste out to A1 Organics, where they are processed into beautiful, soil-enhancing, life-supporting compost! Yay!